This is a book with which I was not hitherto familiar, but it is entirely delightful. It is a slim volume brought to life not only by the colourful sketches but by the droll commentary on the many features of pre-war pubs in London. It is in fact, not unlike a historical London Pubology avant la lettre, for it was published originally back in 1939. There are chapters on West End pubs, games in pubs, pub eating, al fresco drinking, and other such topics. However, for the most part, the modern pub-goer will find plenty that is familiar. The carping about young people in pubs hasn’t much changed, nor the ire reserved for breweries taking over and modernising pub interiors and thereby jettisoning all the atmosphere and charm (even if now it’s more likely to be the faceless PubCos that are blamed). It is most pleasing, though, when Gorham makes reference to a pub which still exists, though there are plenty too which do not. One can imagine that the charms of, say, The Star Tavern (Belgravia SW1) — discussed in the chapter on mews pubs — haven’t much changed in 75 years. Likewise, I would hope that readers in another 75 will still be able to find much to delight them in this slender volume. 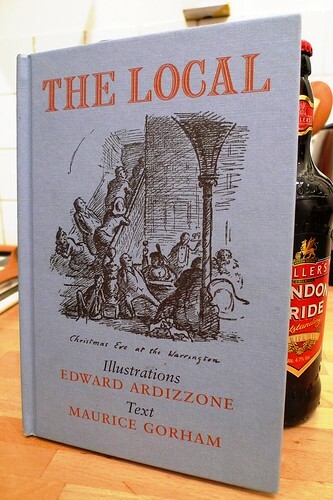 The Local, illustrations Edward Ardizzone text Maurice Gorham. First published 1939, new edition published 2010. Published by Little Toller Books (an imprint of the Dovecote Press). This entry was posted in Books and tagged book reviews, edward ardizzone, maurice gorham. Bookmark the permalink. There’s an equally interesting version published in 1949 called Return To The Local, which updates the scene to how it was immediately after the war.. Unfortunately it tends to be expensive in second-hand bookshops because of the popularity of anything featuring Ardizzone. I shall definitely endeavour to track it down. I was unaware before reading the Ardizzone-centric introduction to this reissue of The Local who he was or that had such a following. The ‘Mother-in-law’ – brilliant beer slang! I cannot believe the library of London pub images you have it’s superb. I was in London recently and went in a Nicholson pub off Bond Street it wasn’t as traditional as I would have liked but still the London Pride was cheaper than the previous pub. Over £4 for a pint of London Pride just doesn’t make any sense. From there I went to a mews pub which served real ales I cant remember the names but what a cracking little pub in the heart of London.